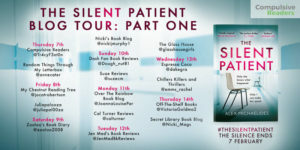 I’m delighted to be reviewing one of the biggest releases of the year today – The Silent Patient by Alex Michaelides. My thanks to Tracy Fenton from Compulsive Readers for the place on the tour and to Poppy Stimpson from Orion for the review copy of the book. There are some cracking books being released in 2019 and The Silent Patient is one of the ones with a lot of noise surrounding it. And oh, I did enjoy it. Alicia Berenson is a patient in a mental health facility. She shot her husband five times in the face and hasn’t spoken a single word since. 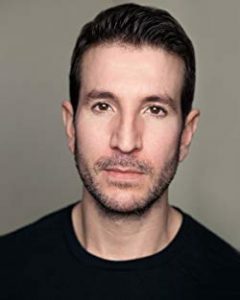 Along comes Theo Faber, a psychotherapist who truly believes that he can change this, he can be the one to get Alicia to speak. After securing a position at the facility where she is, he sets to work with therapy to try and understand what happened on that fateful day when her husband died. The story consists of two strands. One is Alicia’s diary, details of what happened in the time running up to the shooting. The other is Theo’s telling of what happens after he gets the job at the facility and how he deals with Alicia. His story is by far the more dominant one and the one which I enjoyed most of all, but Alicia’s diary is crucial to the story. This is a thriller with a psychological aspect. The author takes us deep into the psyche of both of our protagonists and leaves us with as many questions as answers until all of a sudden that wham bam moment comes along. It’s quite a wait for it but my goodness, I wasn’t expecting it to be what it was. Unfortunately, the presence of that shocking moment is well documented and so I was expecting something quite amazing, but even so, I wasn’t expecting that. The author plotted the book so incredibly well that I had to read that bit more than once and then recalibrate my entire thoughts about the whole thing. 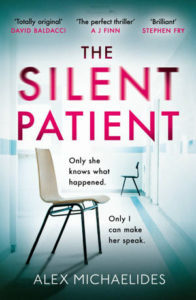 I can see why The Silent Patient is making waves. It’s intense and it’s thrilling. One of the words that came to mind when I was reading was ‘gothic’. It has a gothic feel to it, that darkness, that intensity, Alicia’s silence. With a number of quite short chapters, it kept me turning the pages late into the night. As a debut it’s quite something. Fab review lovely! It is such a good book! I have heard nothing but good things about this book, so I added it to my Book Depository wish list! I’m sure you won’t be disappointed, Davida. I need to get myself a copy of this. I’ve heard all good things and I LOVe that you say it’s got a gothic feel. Fab review! Oh gosh, I hope I have used the term correctly. It’s just that was the gut feeling I had about it. Anyway, either way, it’s a fabulous read.